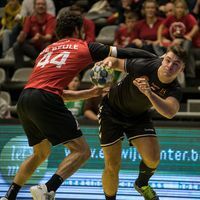 Some of the teams aiming to be part of the Men’s World Championship 2019 in Germany and Denmark have to be on their marks from the very start of 2018. In three of overall six qualification groups, matches start this week already. In group 1, Russia, who won their first two matches against Slovakia (32:22) and Finland 35:22), are chasing their third successive win when playing Luxembourg on Wednesday evening. Luxembourg have one point only so far and have to fight hard to keep their hopes to reach the next phase alive – only the group winners proceed. This also puts pressure on Finland and Slovakia who face each other on Thursday evening. Slovakia have two points, while Finland have one, hence both cannot afford to lose any further points, if they want to keep up with Russia. Just like Russia in group 1, the Netherlands have won their first two matches in group 5, but are in for a tough fight as they meet Turkey on Thursday evening in what can be regarded as this week’s top qualifier. Turkey are second in group 5 with three points, just one behind the Netherlands. With only one respectively zero points, it is ’last call’ for Belgium and Greece who meet in Leuven, Belgium also on Thursday. In group 6, which consists of only three teams, things are more equal. Only two matches have been played so far, both between Bosnia-Herzegovina and Estonia. Bosnia won 31:24 at home before losing the return encounter 29:25. On Wednesday, the third team in the group, Switzerland, enter the competition, as they travel to Tallin to face Estonia. In groups 2 (Lituania, Latvia, Israel and Georgia), 3 (Romania, Ukraine, Italy and Faroe Islands) and 4 (Portugal, Poland, Cyprus and Kosovo) no matches have been played yet. They are all played in tournament format with matches being scheduled from 12 to 14 January. The six group winners proceed to the play-offs in June, through which the nine remaining European participants at the World Championship 2019 will be determined. Ruling world champions France are automatically qualified, and so are the hosting nations Germany and Denmark. The EHF live ticker is available for selected matches.